Tonight was pretty much like every other night. Becky and I made dinner, fed the kids, gave them baths and tucked each one of them in. However, tonight we had to pack for a little trip. Anytime we plan to leave, we make sure the house and all chores are pretty much done. Well… at least we try to get the house ready. As Becky was downstairs, working away writing a new book, I was upstairs finishing up some laundry. Mind you, it is 11:30 at night. However, doing laundry this late is about the only time I am able to sneak the kids blankets away from them and get them in the wash. If they catch you taking them in the day… well that a whole other issue, but you get the point! As I was putting clothes away in our son, Beau’s room. I couldn’t help but to just go over and cover him up. It’s amazing how peaceful they look when they sleep. He smiled a bit in his sleep & I thought “He is probably dreaming of cars… No he is probably thinking of new plans for his fort that we built in the woods. Yep, I bet thats it!” And with that, I closed my eyes and said a little prayer for him. As a baby, he was faced with a lot of challenges and had been able to overcome all of them. Today, my prayers for him are not to get better, but to always stay strong and happy. As I sat there, not really knowing how long it had been, he rolled over and then opened his eyes. He looked right into my eyes, but didn’t say anything. He just gave me a little smile and then he wiggled his back at me. This is his way to tell me that he wants me to scratch his back. Subtle, right? Even when he is sleeping, the boy loves to get his back scratched, just like his Dad. I scratched his back until he fell back asleep, I gave him a kiss on the head and then I left. 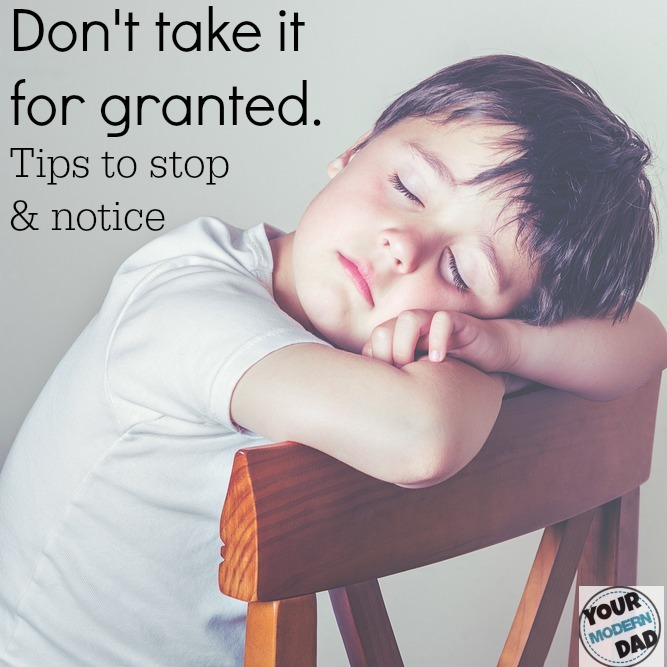 Even in the midst of everything going on, the packing, the cleaning, doing laundry, or working, we are reminded to STOP and notice our kids… really notice them. Even though he was sleeping, and I didn’t think he knew I was there… he did. If our kids notice us even in their sleep, how do you think they feel when we aren’t noticing them in the day?” When we are so busy with everything going on in the day to day, that we forget to sit and just talk to them… or better yet, LISTEN to them. I know, I will be the first one to admit that I take it for granted, because I am trying to do it all and with a family of 6, it’s hard to give that one-on-one time, but we really work at it. Believe me when I say, they notice it more than you think! Take a little time today and “notice” someone. Do not wait for your 5 year old to grab your hand in the middle of his story and say “Dad, can you look at me when I am telling my story!” Just stop and look them in the eyes and give them 100% of your undivided attention. Listen to your kids, because the little things now will become big things later. We all need to appreciate these little moments now, so they come to you with their big moments later.